Customized decal of the popular Austin Texas slogan "Keep Austin Weird". Anyone that has visited the Live Music Capital of the word will recognize this logo. Now you can have your own 2nd amendment twist to the popular saying. 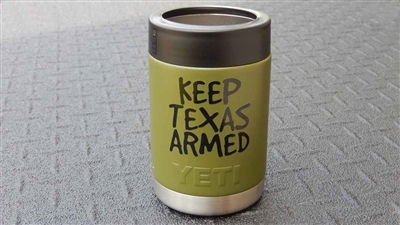 These fit great on your vehicle, gun safe, ice chests, Yeti and Arctic tumblers or other big boy toys. These decals are made of vinyl and easily transfer onto the surface of your choice for a nice clean look. Approximately 2.5 inches wide by 2.0 inches tall.